Vendors are succeeding with land and expand strategies by moving customers into higher-tier packages and by upselling additional products and services from partners. VDC’s Temperature Check of the market shows that vendors are succeeding in evolving and augmenting the functional capabilities of their EMM suites—however; several prominent vendors are struggling with market execution. The global market for Enterprise Mobility Management (EMM) solutions is healthy and gaining momentum, reaching $2.45B by 2020 according to a new report from VDC Research (click here for more info). VDC’s analysis showed that the top three vendors held more than 55% of the EMM market’s revenues heading into 2016. Consolidation and strong market execution has produced a divided market; VMware jumped to 23.4% market share in 2015 (up from 16% in 2014), BlackBerry (counting Good Technology’s revenue contribution) captured 21.4% market share in 2015, and MobileIron captured 10.5% market share in 2015. Each of these vendors is succeeding with land and expand strategies by moving customers into higher-tier packages and by upselling additional products and services from partners. VDC developed its Temperature Check rating mechanism to provide a quick ecosystem assessment of the competing technology solutions providers in a specific market. The EMM Temperature Check reveals that the top 11 EMM vendors accounted for approximately 90% of the market’s global revenues heading into 2016. 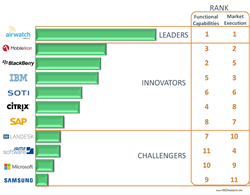 Vendors’ combined functional capabilities scores (based on 13 criteria) and their market execution scores (based on 8 criteria) produced the ranking (see chart).